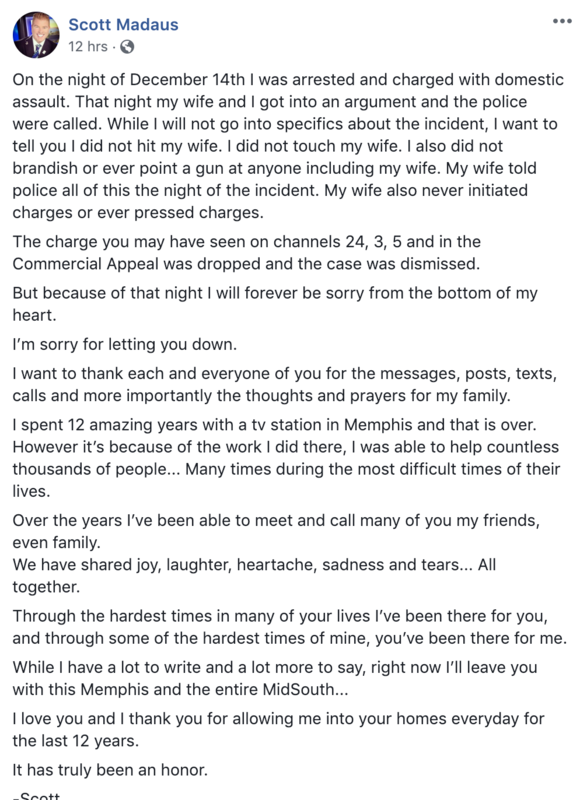 Nearly two months after former WHBQ Reporter Scott Madaus was arrested on a domestic violence charge, he spoke out on social media — not about the charge, but how he regrets letting his viewers down. The charges were dropped against him. According to a police report, Madaus and his wife were drinking when an argument escalated and she tried to leave their home. Madaus, the report said, grabbed her packed bag, set it on the front step and closed the door. When he began to vandalize their home, she locked herself in a bedroom and called police, the report said. Police said the home was in disarray when they arrived and that his wife had a scratch on her neck. Madaus, officers said, became irate after they entered the house and ordered them out. Officers found two Glock handguns, but no gun charges were filed.